I bought this cabinet a few months ago and it is truly wonderful. 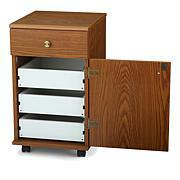 It has great storage and is a durable piece of furniture. I assembled the cabinet in about 4 hours combined. I had a piece that was broken and it was replaced quickly by the company. I assembled it alone without assistance. 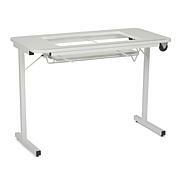 This sewing table is my dream come true! It opens up huge, big enough for my big quilts I make for my business. We had one broken piece I called the 800 number and got the nicest lady and they were shipping it out the same day. My husband an excellent carpenter and it took 3 days to put together. But it is so worth it. When closed up it makes a beautiful piece of furniture in my Cowgirl Cave! You can't go wrong with this. This cabinet is amazing! 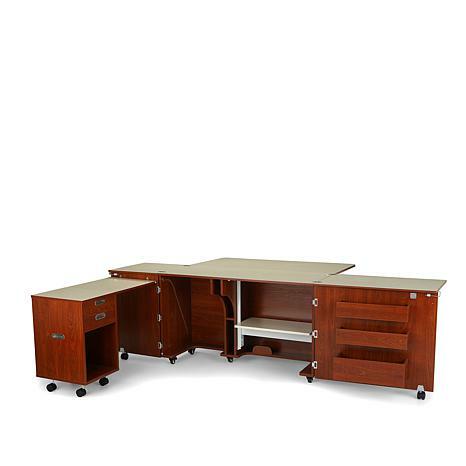 It has 12 swivel casters to help open & close it with ease! We had an issue with the EZ-lift gas strut mechanism which has PLASTIC PARTS & THEY EASILY BEND with half the weight they say it holds. My sewing machine weighed half the 50 lbs it promises to hold. THEY SENT OUT REPLACEMENTS IMMEDIATLY! We had WOODEN SECTIONS & parts arrive that were DAMAGED, but their CUSTOMER SERVICE SENT THEM OUT ASAP!!!! The cabinet TAKES MUCH LONGER TO ASSEMBLE! My husband who is very handy with assembly instructions also had their U-Tube instructions to help, and it took twice the time to assemble!! Otherwise the cabinet on the left rolls out and stays attached to allow for setting up of another machine or cutting board! 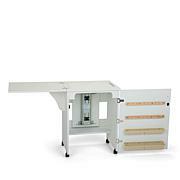 It it easy to store your long cutting boards, extra long rulers in the divider below. 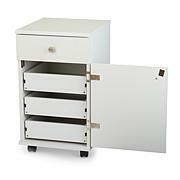 The clear plastic organizers are big & sturdy and hold everything from pins to patterns and fabric. I bought this a couple of months ago and have never been so disappointed in my life. It is an expensive piece of JUNK! The lift comes off the flimsy track and is difficult to get back on the track, if at all. The paint flakes off, doors do not align, nor stay shut. I had a carpenter friend look at the completed unit. He agrees the quality is very poor. It is a substandard MDF which is used throughout. I would NOT recommend anyone purchase this as you are wasting your money. I read the reviews which were mainly positive which helped me decide to purchase this poor quality cabinet. Design is good but their must not be any quality control involved. I do not fault HSN but the ARROW company itself. DO NOT BUY!